Now that mosquito season is over, we can laugh about it, right? It wasn’t soooo bad… well, except that one time! 🙂 And of course they’re never as bad when you’re on the water compared to in the bush! Yes, we have mosquitoes in Northern Alberta… many, many mosquitoes. I came across some neat facts today about them in Social Studies: The Best of the Globe and Mail’s Daily Miscellany of Information. My comments are in italics. – “Mosquito” is Spanish for gnat and originally applied to many small species of bloodsuckers. – Worldwide, there are about 3,400 species of mosquitoes. Canada has at least 77 species. The tropics have the most varieties, but the father north you go, the greater the number of individual skeeters. Northern mosquitoes buzz louder, land harder and itch more. I knew it! – Canadian researchers in the Arctic have reported a rate of 9,000 bites a minute. That would drain a person’s blood in two hours. For the record, in all my life, I’ve never experienced 9,000 bites a minute! Not even close… that is crazy! And who would ever sign up to be the bait for that experiment! – It is the females who bite, to get sustenance for their eggs. Male mosquitoes feed entirely on plant juices. Activity peaks at dawn and dusk. It takes 90 seconds for a biter to become fully gorged. A well-fed female can fly carrying twice her normal weight in blood. – Hungry mosquitoes will attack a warm billiard ball, but they prefer people. They are attracted by carbon dioxide, lactic acid, moisture, and warmth; nervous, fidgety people are twice as likely to be bitten as calm individuals. Stay calm! Mosquitoes are twice as attracted to blue as any other colour, and have a yen for people who eat bananas. Accumulated sweat is also a turn-on. And it isn’t for your fellow-paddlers! Although you may be tempted to throw hygiene to the wind, don’t let yourself get too stinky or you’ll regret it! – Some species prefer to attack birds or reptiles. Charles Hogue, an entomologist at the University of Southern California, has said that only 10 percent of the world’s species are interested in biting humans and far less than that carry diseases. – A mosquito bite begins to itch after about three minutes. This allergic reaction can diminish over the spring and summer as a person develops a tolerance; the bumps will be smaller and won’t hurt as much. However, moving to a new region and being bitten by a different species means building a tolerance all over again. There are a few other points that I know personally. The first ones of the year, in May, are slow and stupid. The later generations (or species) to hatch are much faster and hungrier — positively fierce! When you’re far enough north, there’s no getting away from the bugs — mosquitoes use standing water to lay their eggs in, and blackflies use moving water. So, mosquitoes don’t tend to be as bad along a river, unless there are sloughs or ponds around as well. Blackflies are more abundant farther north, along the Mackenzie River in the Northwest Territories, for example. Bats are voracious mosquito-eaters, consuming a few hundred in flight in one night. Dragonflies will eat them as well, which makes them my favourite insect. – Mosquito repellent. Bug dope. Whatever you want to call it, it is definitely helpful at keeping the skeeters off you. The problem is, it’s a pretty nasty chemical, which is why there are warnings on the bottle. Don’t put on skin under clothing. Don’t reapply too many times. Don’t put it on young children. One warning they don’t include: Don’t spray your hands and then wipe your eyes! Yeow! In the photo above, number 4 has the highest deet, but number 1 or 5 will also work, and number 2 to a lesser degree. 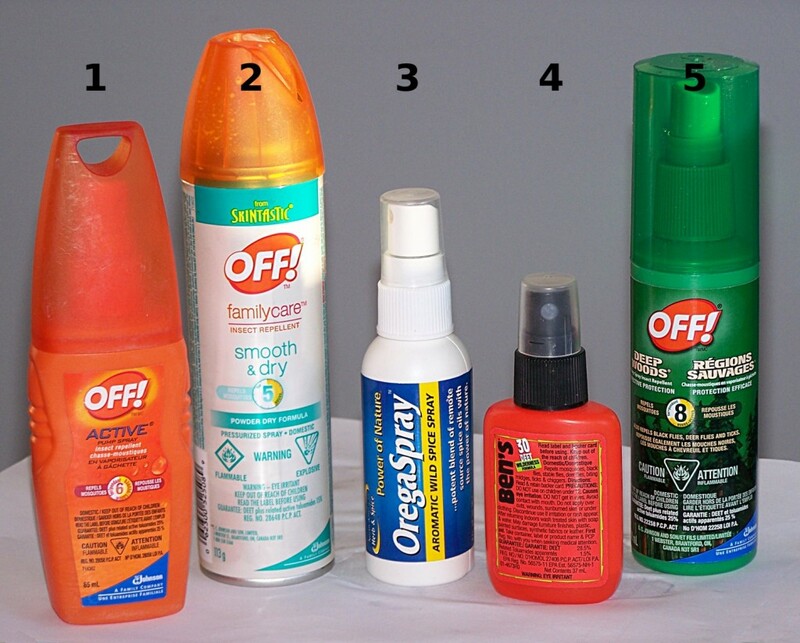 – Organic bug spray, Orega Spray, made of oil of oregano, clove, wild lavender and wild bay leaf, is a great option if you’d like to stay away from the pesticides (number 3 in the photo). I wouldn’t use it in the bush, but I tested it in our back yard, it was quite effective. It would probably be effective in the bush, but since it makes you smell like an Italian restaurant, that might attract bears. I’m pretty sure they like Italian! Oh, did I mention that it’s expensive? Essential oils aren’t cheap! – Antihistamines. If you get very itchy from mosquito bites, you can reduce your allergic response by taking antihistamines in advance. Vitamin C is a natural antihistamine, so you can try 2,000 – 4,000 mg per day. You will pee out the extra vitamin C that your body doesn’t need, but if you are having an allergic response, your body will use it!